Kharne is a roguelike being developed by Dave Moore in Delphi. It is a rewrite of a decade-old roguelike, also called Kharne, by the same author. 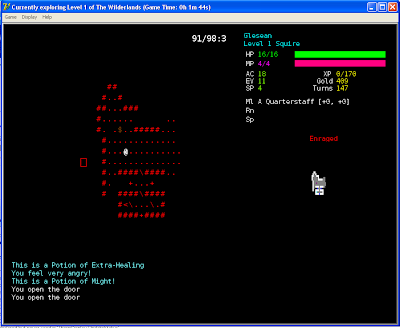 The original Kharne (subtitled 'The Revelation') was a roguelike released in 2001 for the Windows platform, programmed using Delphi. Heavily graphical, it featured the David E. Gervais tileset, drag-n-drop inventory management, and gameplay based heavily upon AD&D. However, magic and many other features were never implemented, and the game was (despite an abortive rewrite using the then-newly-released DnD 3rd Edition rules) offically abandoned in 2002. 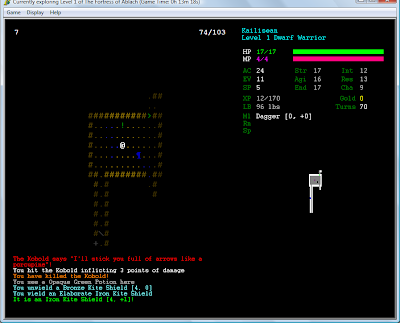 The new Kharne is effectively a completely new game and features traditional ASCII graphics (within a Windows framework), multiple dungeons, a SQL-lite database backend; many other new and enhanced features are in the works. The full version is planned to be released eventually, however Alpha versions are currently available from the Kharne development diary website at http://kharne-rl.blogspot.com. Kharne is released under the Mozilla Public License (MPL) v1.1 and source code is downloadable from a Googlecode SVN (http://code.google.com/p/kharne/source/browse/). This page was last modified on 16 July 2011, at 00:52. This page has been accessed 37,666 times.